The NHL announced the starters of the All-Star game chosen via the fan ballot. 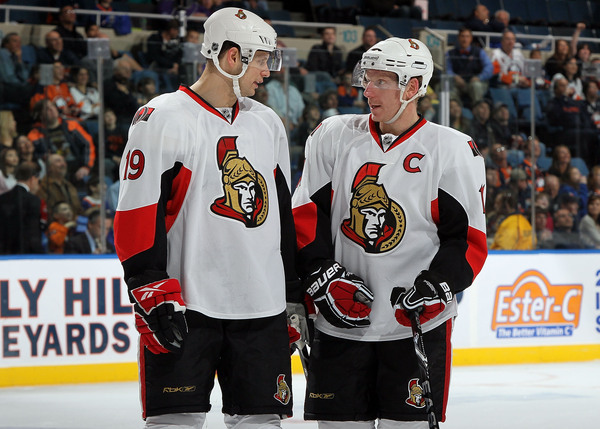 For forwards, the Senators trio of Daniel Alfredsson, Jason Spezza, and Milan Michalek were selected. For defensemen, Erik Karlsson joins his fellow Senators along with the Leaf’s Dion Phaneuf. Tim Thomas of the Boston Bruins will start in net. The city of Ottawa rallied around their star players to get them into the All-Star Game to get a little home ice advantage. Dion Phaneuf snuck by the fifth Senator defenseman, Sergei Gonchar, and rightfully deserves this spot as his solid defensive play and leadership has led the Toronto Maple Leafs to a resurgence this season. Thomas won the goaltending vote by a landslide as he won the Vezina Trophy last year as the league’s best goalie and has been lights out this year. The remaining 36 All-Stars will be announced later this month. The All-Star weekend begins January 26 with the fantasy draft. The Skills Competition will be held on January 28 followed by the actual All-Star Game on January 29. This entry was posted in News, Trades, & Signings and tagged All-Star Game, Boston Bruins, Daniel Alfredsson, Dioin Phaneuf, Erik Karlsson, Jason Spezza, Milan Michalek, NHL, Ottawa Senators, Tim Thomas, Toronto Maple Leafs. Bookmark the permalink.